How is today the first of March? This week, and what seems like 2018, has gone by incredibly fast! Though our schedules stay busy, this week has been especially crazy for us with the start of our kitchen makeover. I say makeover, because the changes are more cosmetic than structural (hardware, lighting, fixtures, cabinetry, etc). My goal was to have everything ordered and on-hand prior to beginning the redesign in hopes of a quick, five day install, but I’ve learned that regardless of how prepared you think you are delays are inevitable with construction. Much of my week has been spent sourcing additional materials, tracking and placing new orders. I’m also famous for making impromptu decisions (you know, as if things weren’t already interesting), this project being no exception. 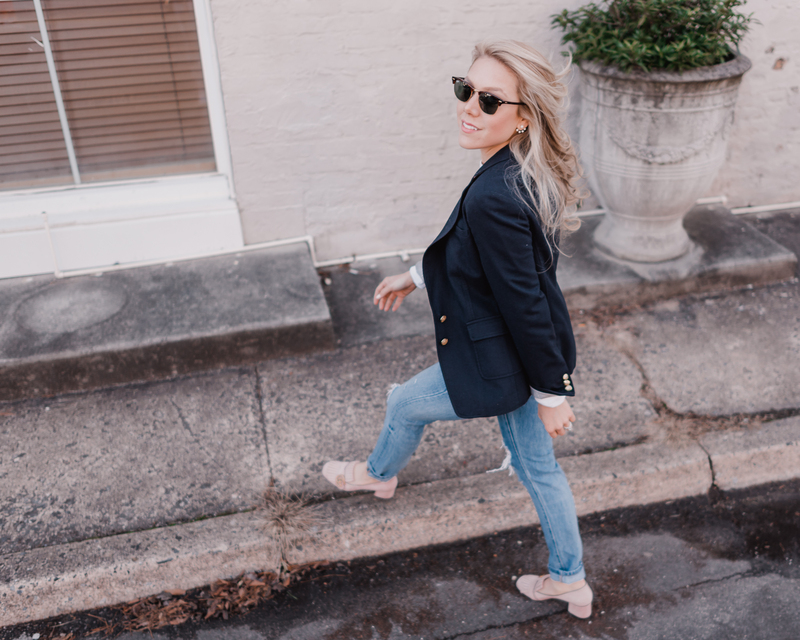 My “uniform” this week has been distressed denim, a comfy tee and relaxed blazer; an ideal and professional combination when doubling as business owner and assistant to a general contractor. 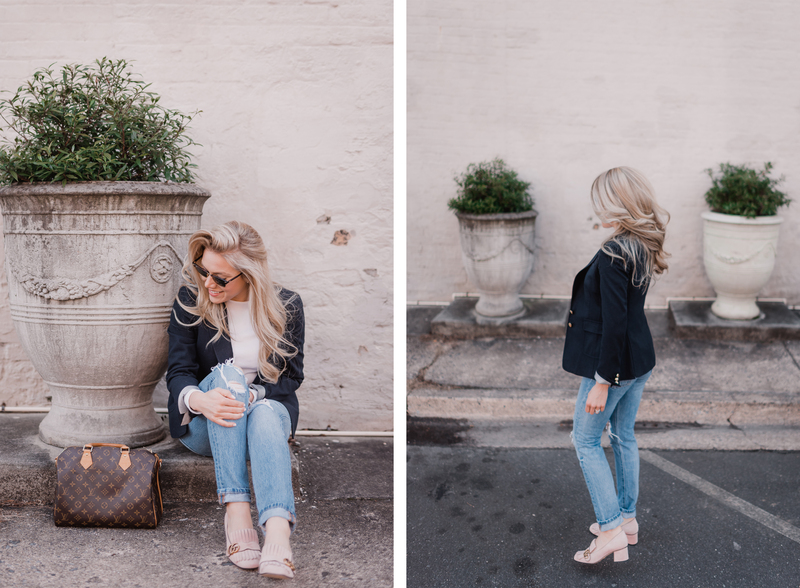 In all seriousness, blazers have always been my closet go-to. 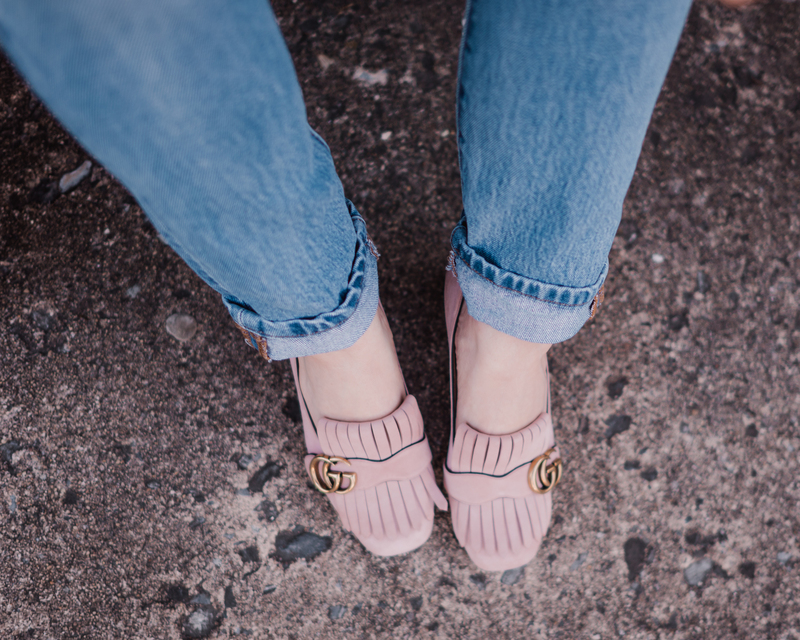 They’re so versatile and add a polished touch whether paired with a skirt, shorts, dress, slacks or jeans. 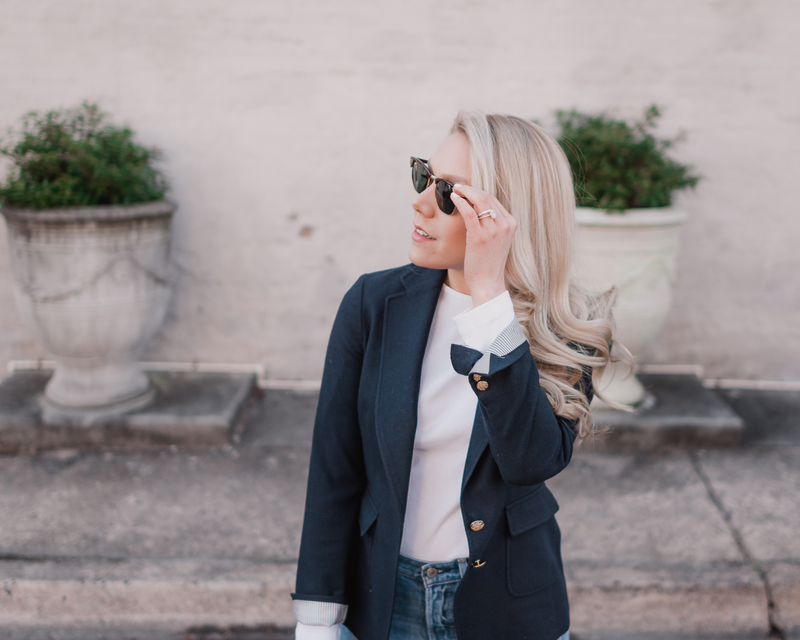 The navy blazer worn in today’s post is going on year five; I love this thing! There are so many beautiful options available for Spring: floral, pastel, linen, you name it! 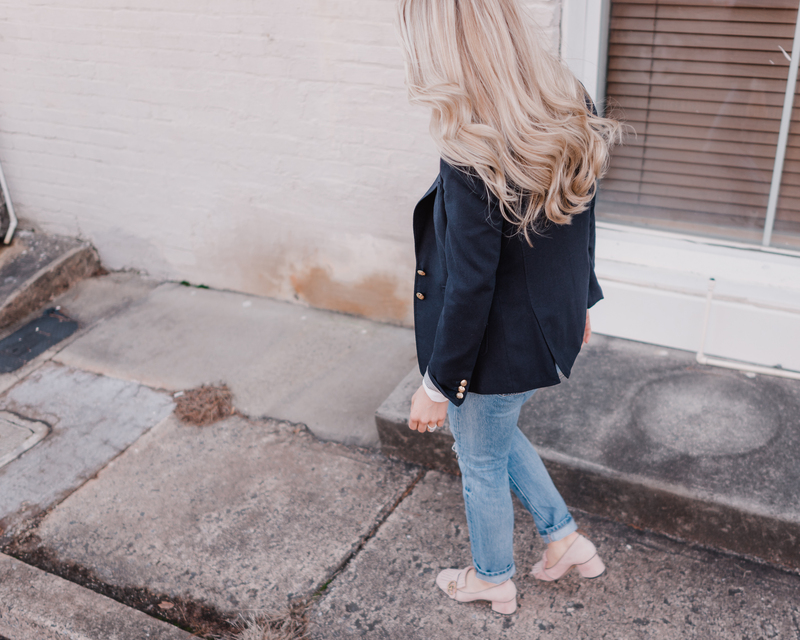 Below are a handful of options, including a blush linen jacket for only $64! Linen is hard to come by at that price point! Of the many lessons I have learned over the years, none holds better to the art of shopping than the thought that you get what you pay for. When the buy is meant to last one season there’s value in not spending much! If it’s a piece you’ll use and love for decades, though, higher price tags are worth it. Intelligent design, quality and uniqueness are all things that luxury brands excel at, so knowing that something made of quality will be in rotation for years makes it worth the investment. 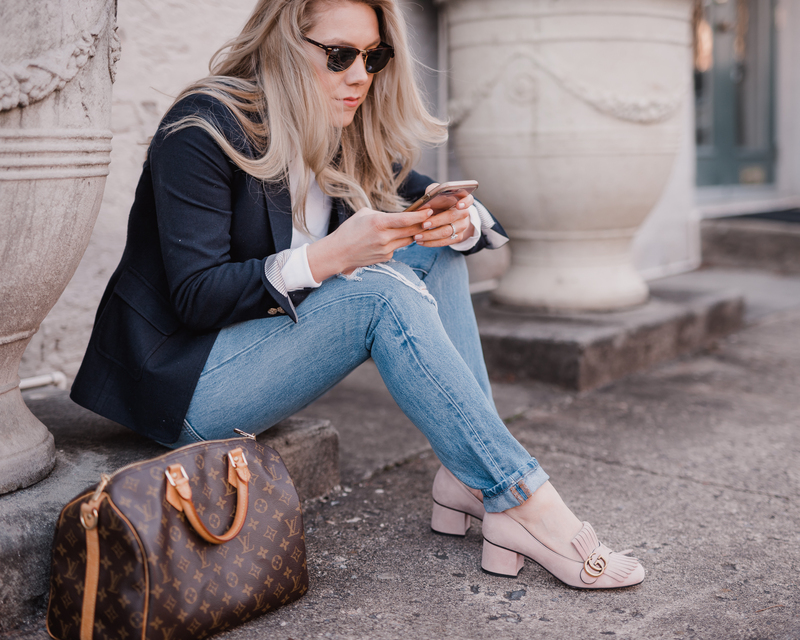 For me, those things are most often accessories: shoes, scarves, purses, belts and outerwear (labeling outerwear as an accessory is debatable, yes, but I often do). 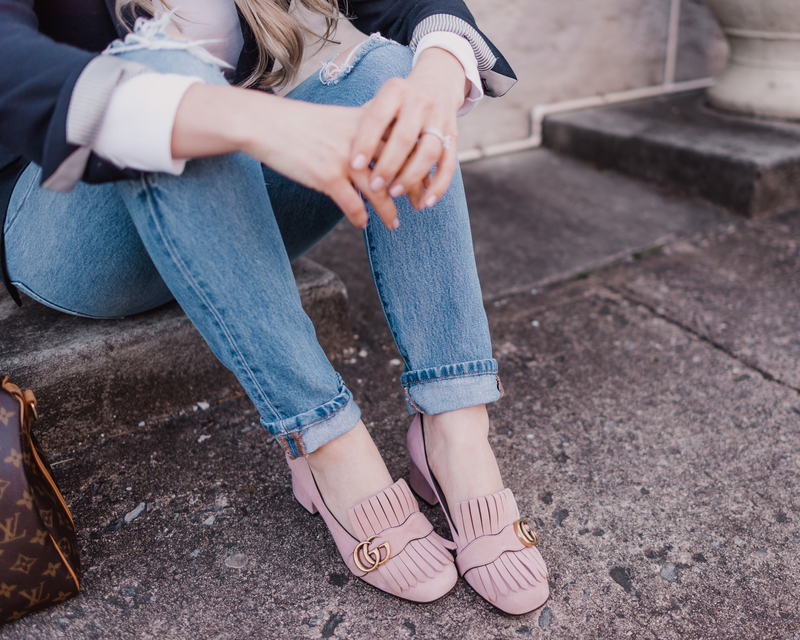 Blush is a color I wear often, it’s very much a neutral in my wardrobe, so these Gucci pumps were a must! They’re the most comfortable pair of shoes I own! 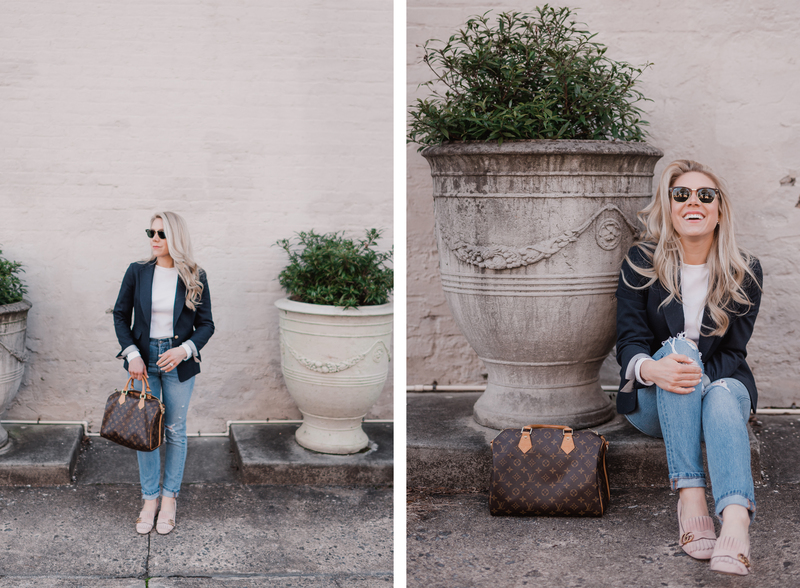 Another splurge worthy accessory is the Louis Vuitton Speedy 35 (my husband purchased this bag for me during our first trip together to NYC). It’s a great neutral bag that gets better with age. I take a lot of pride in my things regardless if they are $7 or $700. My husband says it’s one of the many qualities he loves about me. 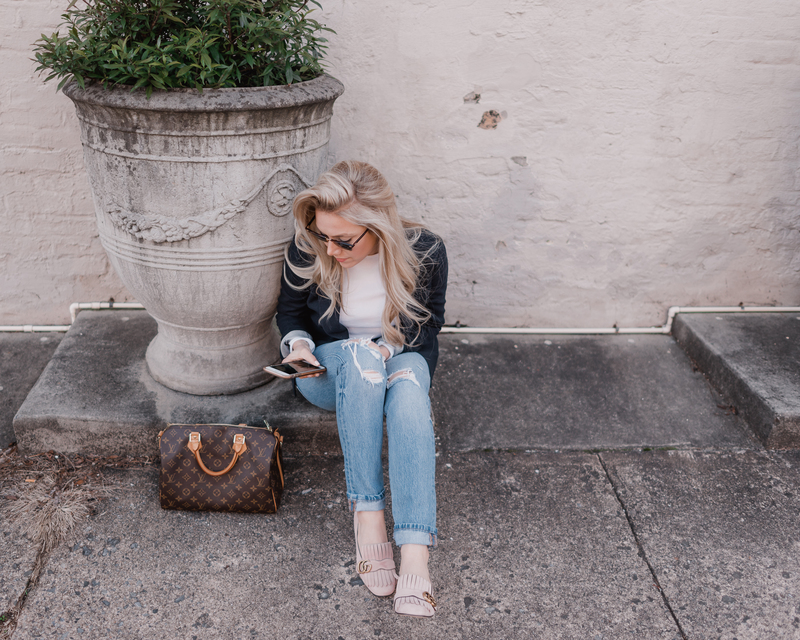 When it comes to denim, I’ve found that price doesn’t necessarily reflect quality. 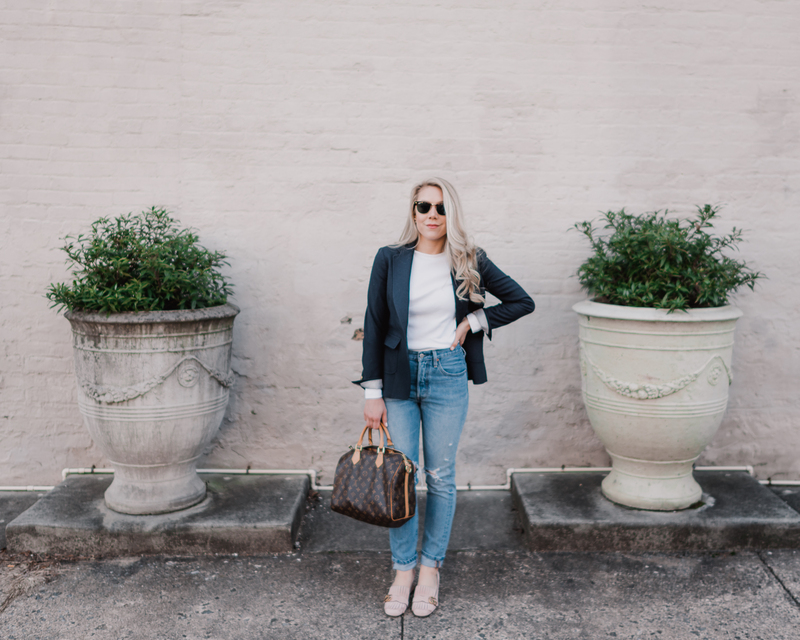 My two favorite brands are: Levi and Everlane. 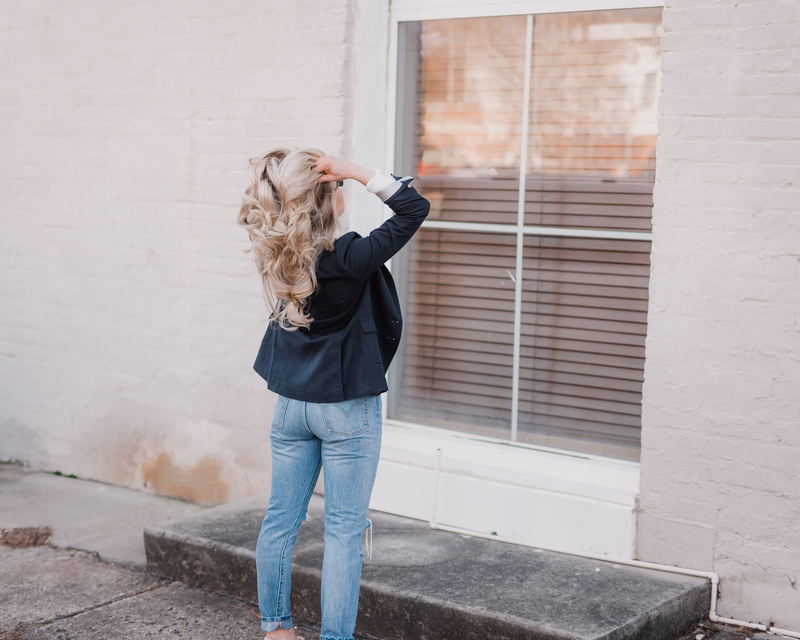 Last week I shared a detailed post (here) on what I look for when shopping for white denim, specifically. Another great option to consider is Anthropologie’s exclusive line, Pilcro. Below are a few of my favorite options. The round-up includes denim shorts for $68, white crops for $68 and lemon patterned crops for $128. Hopefully you’ve all had a wonderful week! Thank you for continually supporting Style Souffle; y;all mean the world to me!